Media planning and media buying are changing. While lots of attention has been given to the growth of RTB, traditional IO-based buying processes are changing as well. 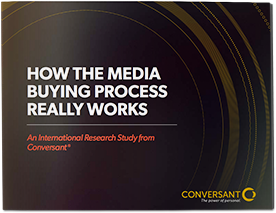 This exclusive Conversant study reveals the ins and outs of today’s agency-led IO-based media planning and media buying process. What are the trends for spending levels and channel adoption? How many RFPs are media pros typically sending out? Who decides what gets bought, and who influences? What do planners and buyers think about personalization and personalized media? What topics do agency teams want to learn more about in the months ahead? Which publications are agency media experts accessing for industry info? Download our media buying process guide to see how you could get ahead of the curve.